Even though children are surrounded by other kids at school, they often don't feel seen or acknowledged. 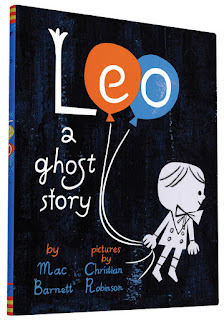 Mac Barnett and Christian Robinson tap into this feeling in their delightful story about Leo, a little ghost who makes a friend. Leo has a hard time making friends because he’s a ghost. No one can see him. But we can. He’s pretty satisfied spending time by himself, but he is happy when a family moves into his house. It's good to have company. But the family doesn't see things the same way. Kids will know just what it's like not to be wanted, and they will empathize with Leo as he leaves home. The cool blues of Robinson's illustrations match the soft, subdued mood. 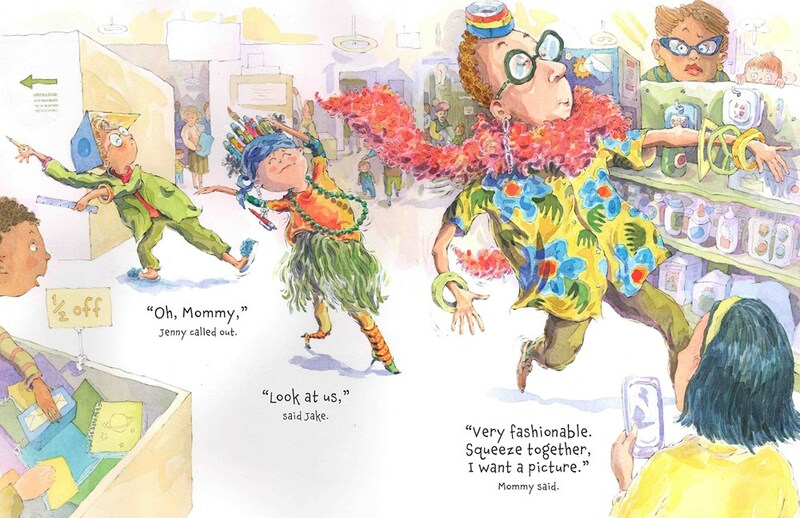 One afternoon, "Leo found himself roaming along a sidewalk covered in drawings." Jane looked right up at Leo and asked if he'd like to play. At first, Leo is stunned that she's talking right to him. "Leo, do you want to play Knights of the Round Table?" Leo is delighted by her imaginary play as she knights him in their game, but he's nervous that she will be scared when she finds out he’s a ghost. I love how accepting Jane is, how open she is not only to Leo but also to her own imagination. Jane is kind, direct and self-assured--definitely one of my favorite characters this year. I won't give away the ending, but be rest assured that it will bring a smile to your face and let kids know that they can find a friend who likes them just the way they are. Enjoy this book trailer. Just like the book, the kids' voices shine through. Illustrations ©2015 Christian Robinson. The review copy was kindly sent by the publisher, Chronicle Books. If you make a purchase using the Amazon links on this site, a small portion goes to Great Kid Books. Thank you for your support. As your little ones come home from their first few days of school, do they talk much about it? Or do you have to poke and prod to find out about their school day? 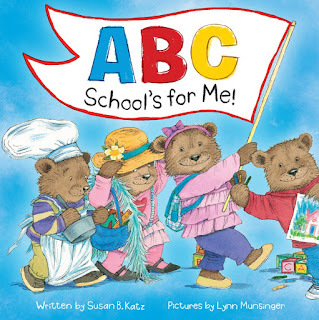 In either case, Susan Katz's newest picture book is a delightful way to celebrate and talk about the school day for preschoolers and kindergartners. With delightful rhyming couplets, Katz celebrates playful school activities from a typical preschool or kindergarten day. She uses the alphabet to guide the story, starting each line with a different letter which is highlighted in bold block print. But the real delight comes from the adorable bears parading through their day. "Books that are just right for me. "It's a first-day-of-school stress reliever." Illustrations ©2015 Lynn Munsinger; used with permission from the publisher. The review copy was kindly sent by the publisher, Scholastic. If you make a purchase using the Amazon links on this site, a small portion goes to Great Kid Books. Thank you for your support. I have to be honest: I feel torn about back-to-school shopping. I love getting my kids organized, but I hate the pleading for useless knick-knacks or trendy decorations. But one thing's for sure: it's all part of getting ready for school. 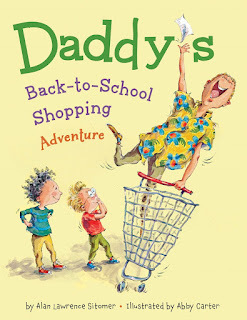 Alan Lawrence Sitomer, California's Teacher of the Year in 2007, celebrates this tradition with a silly, heart-warming story: Daddy's Back-to-School Shopping Adventure. It's time for back-to-school shopping, and siblings Jenny and Jake know that the number-one rule is "We only buy what's on the list." But that doesn't mean shopping can't be a little fun. This family knows how to be goofy. 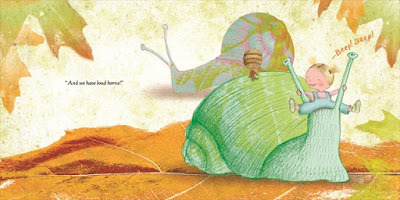 The illustrations are giggle-inducing, full of exaggerated movement and lots of details for kids to enjoy. "Look at us," Jenny called out. When Daddy finds a lunchbox that's just like the one he had when he was a boy, he just has to have it. In a humorous role reversal, now it's the kids' turn to say, "Uh daddy... Is it on the list?" I loved how the dad then turned to a softie, trying to negotiate and wheedle his way to get his coveted lunchbox. Sitomer balances the humor with a heartwarming ending. Illustrations ©2015 Abby Carter; used with permission from the publisher. The review copy was kindly sent by the publisher, Disney Hyperion. If you make a purchase using the Amazon links on this site, a small portion goes to Great Kid Books. Thank you for your support. Back-to-school stories usually focus on what it's like to start school, but what happens to sibling's relationships when kids head off to the classroom? Lori Nichols' newest book provides a tender and charming look at how two sisters cope with the transitions when one of them heads off to school. Maple and Willow have loved playing together all summer, but when it's time for big sister Maple to start school the transition is especially hard for Willow. "Home wasn't the same without Maple." And when she came home, Maple couldn't stop talking about her new friends. 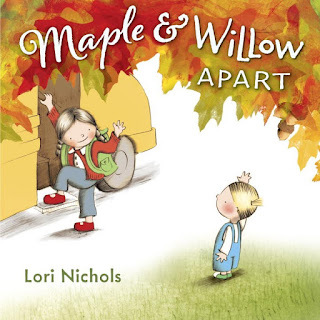 I adore how Nichols shows Willow's perspective, how she tells about her new friend Pip -- an acorn-topped sprite she finds under a tree -- how she explores and finds things to do when Maple is away. "I had fun too," said Willow. "I played with Pip." I especially love how Nichols uses her delightful illustrations to develop the story, keeping the language spare. Each picture focuses on the children and their world, but there's enough space to let the reader imagine themselves as being there too. "And we have loud horns!" 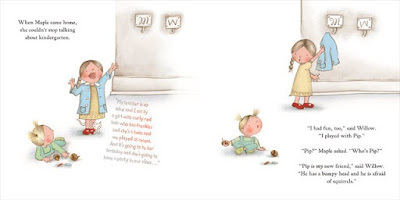 Nichols develops the relationship between Maple and Willow in perfect balance, moving back and forth from each sister's perspective, helping children empathize with both sister. You can see just how excited Maple is to start school, but also how much she misses her sister. And the ending still has me smiling, as the sisters come up with just the right solution. The next morning, Willow had a surprise for Maple. "Maple, Pip wants to go to school with you today." Illustrations ©2015 Lori Nichols; used with permission from the publisher. The review copy was kindly sent by the publisher, Nancy Paulsen Books / Penguin. If you make a purchase using the Amazon links on this site, a small portion goes to Great Kid Books. Thank you for your support. 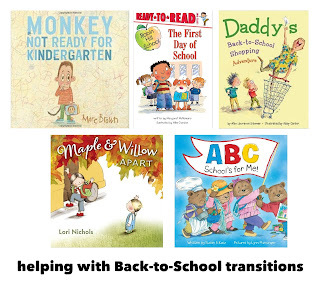 Transitions are not easy, especially going back to school. This beginning reader captures these transitions in a very relatable way. I was especially looking for a book with a character of color, and love how Gordon creates this diverse classroom. "Kids starting school will recognize the truth about how big the change will be--how hard it is to let go of old routines as well as the joy of returning home to a loving welcome." This beginning reader works well, both as a read aloud for kids entering kindergarten and as a level 1 beginning reader for children who can read simple sentences with short words. I was especially looking for a back-to-school book featuring a character of color, and the illustrations are perfect--both funny and full of feeling. Are you getting nervous about the beginning of the school year? Who gets more nervous, kids or parents?? Will your child be able to make the transition to a new school, new teacher, new friends? There's nothing like the nervous excitement of the first day of school. Some kids are raring to go, while others are tentatively clinging to their parents. 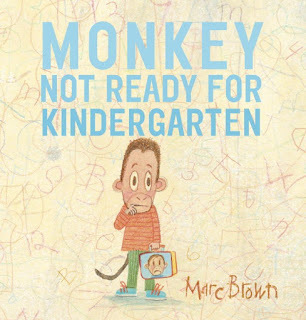 This week, I'll share five of my favorite back-to-school picture books, starting with Monkey Not Ready for Kindergarten by Marc Brown, creator of the Arthur books and TV show. 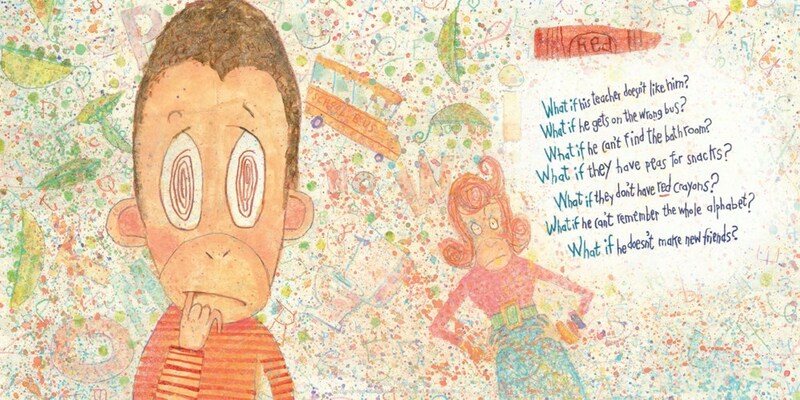 As the start of kindergarten gets closer and closer, Monkey's worries grow. 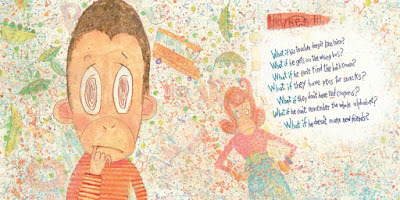 "What if his teacher doesn't like him? What if he gets on the wrong bus?...What if he doesn't make new friends?" His parents try to help ease his worry, and kids will relate to the back-to-school rituals: getting a lunchbox, playing school at home, having a playdate to meet new friends. "It's almost time for kindergarten!" "What if his teacher doesn't like him? What if he gets on the wrong bus?" 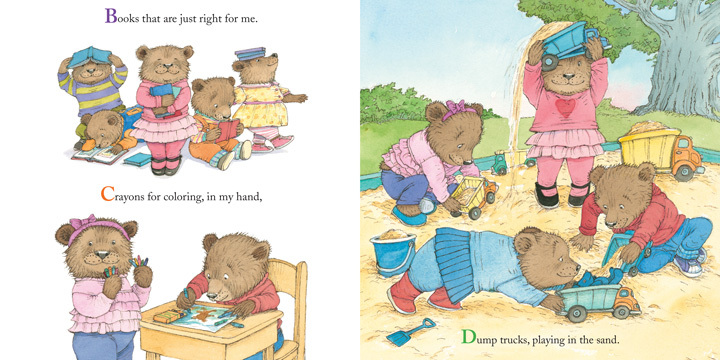 Marc Brown's illustrations are both funny and reassuring. The handwritten text adds a colorful, child-friendly feel to the story. 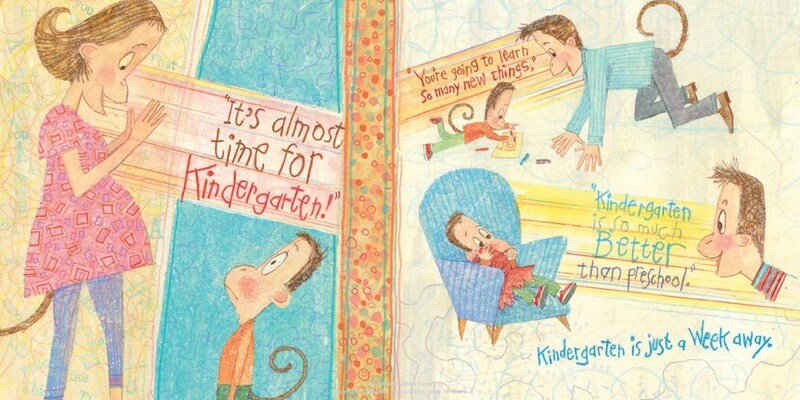 This is a lovely story to read to ease back-to-school worries. My favorite page? The night before kindergarten, when Monkey helps get everything ready: making his lunch, putting his favorite book all about bugs inside his backpack so he has "something to remind him of home." 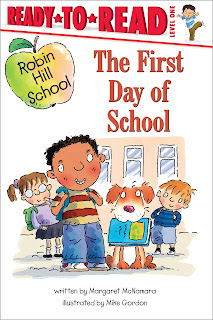 Enjoy this book either before the first day, or a few weeks into school, and talk about how your own family is coping with the transition of going back to school. And hope that Monkey comes back for more! 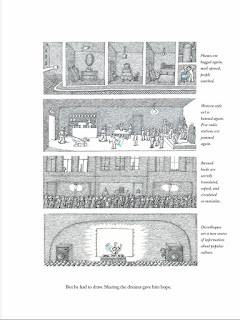 Illustrations ©2015 Marc Brown; used with permission from the publisher. The review copy was kindly sent by the publisher, Alfred A. Knopf/Random House. If you make a purchase using the Amazon links on this site, a small portion goes to Great Kid Books. Thank you for your support. What do other kids think of me? I'm sure that no one can understand how I'm feeling. While any of us might have these thoughts once in a while, they are particularly intense for tweens -- kids ages 9 to 13 who are no longer little kids, but not quite teenagers. I've noticed that kids this age often turn to realistic fiction, perhaps reading to see how others cope with all the changing friendship dynamics that are happening around them. Fans of Wonder, by R.J. Palacio, are often touched precisely because they can see inside these social dynamics and get to know a kid who must struggle with these questions. I was eager to read Palacio's companion novel, Auggie and Me, knowing how well she had helped us see inside different characters before. I'm definitely looking forward to sharing these stories with students--they will lead to some thoughtful conversations about empathy, kindness and understanding one another. 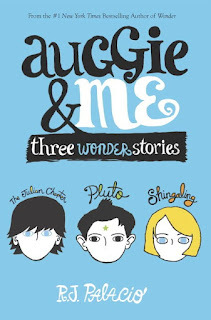 In Auggie & Me, Palacio delves into three secondary characters from Wonder: Julian, Christopher and Charlotte. This is definitely NOT a sequel--the action takes place before and during the same time as Wonder. It does not tell the story of what happens to Auggie after Wonder finishes. But it is a companion novel (or rather three short books) best read after Wonder, "an expansion of Auggie's world," as Palacio writes in her introduction. The three characters at the center of these short books were all impacted by Auggie, but these are their stories. We get to understand Julian, how his nightmares affected the way he reacted to Auggie, how his mother kept making excuses for him as opposed to helping him take responsibility for his actions. Palacio doesn't justify or defend Julian's actions, but she helps readers see inside him. And she lets Julian, who was so awful to Auggie in Wonder, go through his own transformation. Charlotte's story, in Shingaling, shone the most brightly for me, perhaps because her insecurities resonated with me, or perhaps because her friendship struggles were separate from Auggie's and so more fully developed as a standalone story. But most likely, it's because of the way that Charlotte learns to overcome her worries, her social anxieties and her own inner-judgments to become friends with two girls she didn't know at all before 5th grade started. Families and teachers will enjoy reading Auggie and Me aloud precisely for the way it leads to conversations, just like Wonder did. There are times that reading Julian's voice may be difficult, with his casual cruelty and naive declaration that he didn't mean to hurt anyone. And Charlotte sounds a lot like an insecure kid at times. But these voice rang true to me, and they let readers see inside other kids. 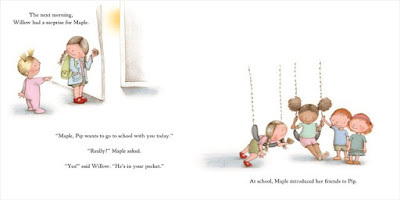 In the end, Auggie and Me helps create empathy, leads to conversations about kindness and trust, makes way for small steps toward accepting others for who they are. The review copy was kindly sent by the publisher, Alfred A. Knopf/Random House. If you make a purchase using the Amazon links on this site, a small portion goes to Great Kid Books. Thank you for your support. "During this time, I pay special attention to stories that cultivate kindness and community, as well as courage and tenacity. These are qualities and topics that we’ll be talking about throughout the year. "Mitali Perkins’s Tiger Boy is an engrossing tale about a young Bengali boy who undertakes incredible risks to save a tiger cub... Vivid action and suspense, conveyed in simple, clear language, make this a captivating choice." I love this choice from Lalitha Nataraj, at the Escondido Public Library, CA. 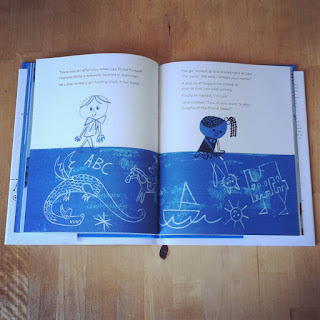 Tiger Boy makes a great read-aloud (see my full review), and if you have the opportunity -- definitely invite Mitali Perkins to come speak with your students. She's wonderful! 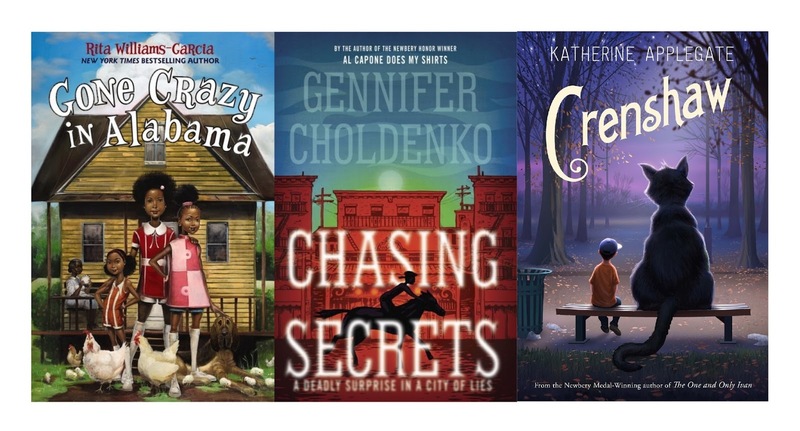 "I look for stories with descriptive language, suspense, and a conflict that will make listeners think when selecting chapter book read alouds. 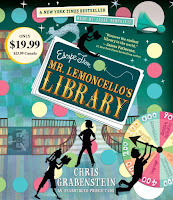 Chris Grabenstein’s Escape from Mr. Lemoncello’s Library makes an excellent choice, offering a perfect blend of mystery, adventure, puzzles, and literary references." My students have loved Grabenstein's mysteries, and I definitely agree with this recommendation from Cathy Potter, the librarian at Falmouth Elementary School, ME. 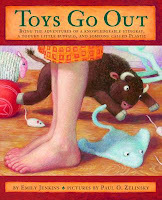 Daryl Grabarek, editor of SLJ's Curriculum Connections newsletter, suggests one of my favorite chapter books, Toys Go Out, by Emily Jenkins and Paul O. Zelinsky: "Jenkins imbues her characters (stuffed animals and a ball) with enormous personality, and their trials and triumphs ring true to this audience, who are thrilled to hear more of their adventures in Toy Dance Party. And now there’s newly released picture book Toys Meet Snow." Families at our school have loved reading this series aloud at home, and it works particularly well for a kids across a range of ages. Finally, friend Allison Tran of the Mission Viejo Library, recommends A Whole New Ballgame, by Phil Bildner, "a feel-good story about friendship, basketball, and the surprising things that happen when an inventive teacher shakes up the fifth-grade curriculum. Readers will instantly warm to the likable and refreshingly diverse cast of characters. The realistic dialog makes this a pleasure to read aloud." I haven't had a chance to read this yet, but I am definitely looking forward to trying it soon. I love how Allison described the book’s message of teamwork. Definitely check out the whole article in School Library Journal. Thanks again to Daryl Grabareck for a great column in SLJ. If you make a purchase using the Amazon links on this site, a small portion goes to Great Kid Books. Thank you for your support. News broke last week that a California child was infected by the plague after visiting Yosemite National Park. Naturally, this caused alarms among families visiting the mountains--what causes this? how common is it? will my family be infected? Today we know that this serious illness is transmitted by rodents (see this info sheet)--but what about 100 years ago? Gennifer Choldenko's newest historical fiction, an exciting story set in San Francisco during 1900, explores many important issues we are still debating today: the spread of infectious diseases, opportunities that women have to pursue careers in sciences, and discrimination against California's Asian American community. On one hand, Chasing Secrets reads like exciting historical fiction, but on the other hand it provides an opportunity to talk about issues our society is still wrestling with today. Turn-of-the-century San Francisco comes to life for young readers as 13-year-old Lizzie Kennedy accompanies her father on medical house calls and wrestles with the realization that a strange new diseases is affecting many people, yet the authorities are reluctant to acknowledge its presence. Lizzie is a terrific character--thoughtful but headstrong, eager to explore but a bit naive, and determined to do the right thing. Lizzie forms a friendship with Noah, the son of Jing, her family’s beloved cook, who is hiding in Jing's room in Lizzie's house. As she gets to know Noah, she grapples with the injustices that exist with gender, class and race. Young readers today will not only find Lizzie a compelling character, they too will reflect on these issues that affected San Francisco at the turn-of-the-century and impact us still today. "The San Francisco setting is particularly vivid, especially the juxtaposition of high society life and the poverty of Chinatown. Characters are well-drawn as well, with Lizzie being particularly appealing. There's humor, heightening suspense, and tragedy. While this is a work of historical fiction, thoughtful readers will make modern day connections to persistent problems of race, class, sexism and access to health care." 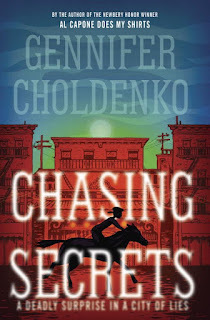 Bay Area author Gennifer Choldenko, who won the Newbery Honor for Al Capone Does My Shirts, creates a tender and gripping story of friendship, mystery and persistence. The review copy was kindly sent by the publisher, Wendy Lamb/Penguin Random House. If you make a purchase using the Amazon links on this site, a small portion goes to Great Kid Books. Thank you for your support. 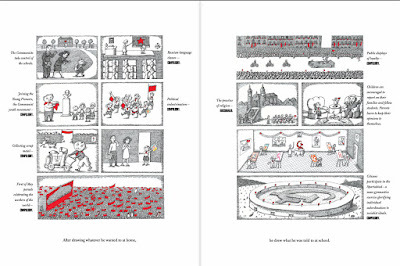 How do you help children understand family stories in the context of history? Our lives are impacted by the social and political climates in which we live--and these impact the stories we tell our children about our own family's lives. 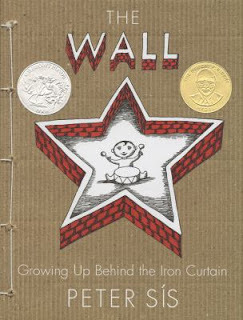 Peter Sís wrestles with these questions in his memoir The Wall: Growing Up Behind the Iron Curtain, telling the story of growing up in Communist Czechoslovakia during the Cold War. Sís begins with a short introduction, giving context to the historical events. And then he starts his memoir by saying how he loved to draw for as long as he can remember. Throughout, he tells parallel stories of childhood and the political circumstances in Czechoslovakia. At home, he was able to draw whatever he wanted, but as soon as he started school, he was influenced by the state controlled propaganda. "The Communists take control of the school. Russian-language classes--COMPULSORY. Joining the Young Pioneers, the Communist youth movement--COMPULSORY." 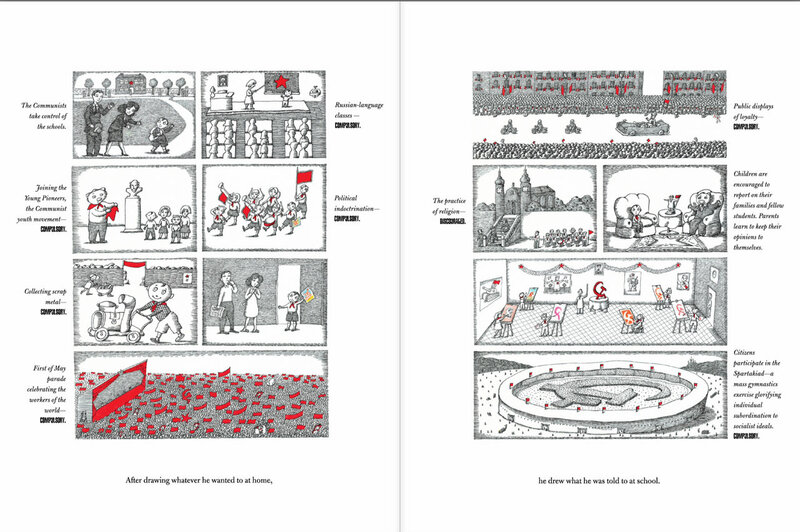 "After drawing whatever he wanted to at home, he drew what he was told to at school." Sís conveys the historical context while giving his personal experience at the same time. The short chunks of text with small panel illustrations helps make the information more accessible and immediate. I find that kids like reading this more than one time, as they notice different details each time. After the liberation of Prague Spring in 1968, the Soviets imposed strict controls once again. But Czechs found ways to push back and share ideas. "Phones are bugged again, mail opened, people watched... Banned books are secretly translated, copied, and circulated as samizdat." Sís struggled to keep his artistic identity and independence. He describes both in his journal entries how he was pressured to join the party. And yet, as he wrote, "he had to draw. Sharing the dreams gave him hope." The journal entries (a sample is below) help give even more immediacy and details to how the political climate impacted his life. 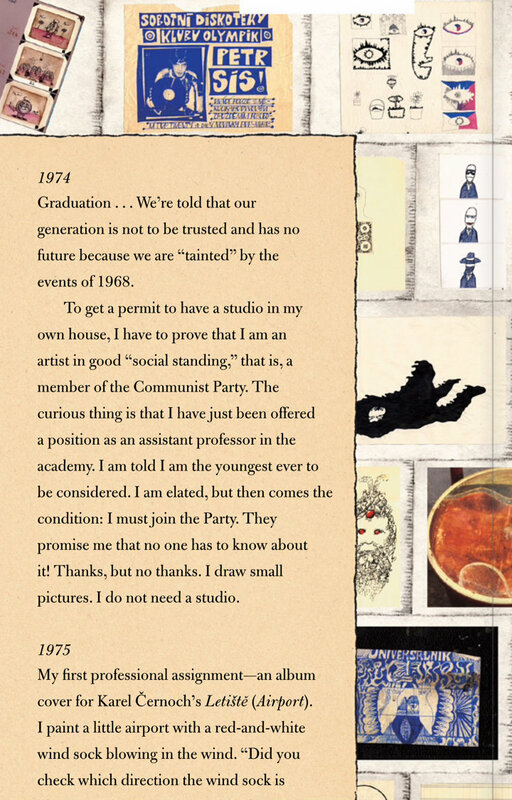 "To get a permit to have a studio in my own house, I have to prove that I am an artist in good 'social standing,' that is, a member of the Community Party." My family and I recently visited the Czech Republic, meeting with several members of the university who have developed a program to honor my great-uncle, George Placzek (a long article about his scientific legacy is in the Cern Courier, the International Journal of High Energy Physics). I was fascinated to hear about how the Communist era impacted their lives, much as it had for Peter Sís. 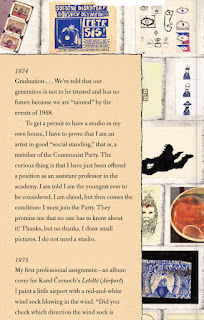 They faced limitations on their professional careers, and even brought a samizdat to show me. "A masterpiece for readers young and old." 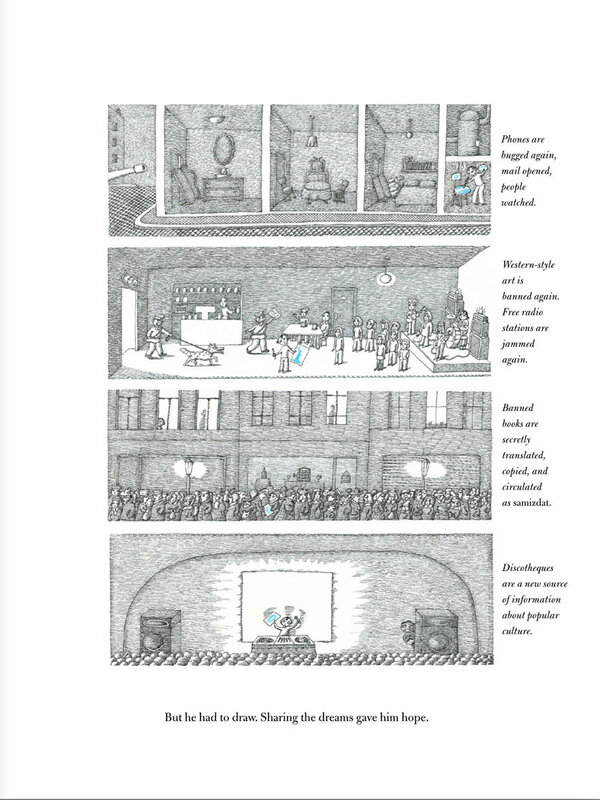 Illustrations ©2007 Peter Sís; used with permission from the publisher, Farrar, Straus & Giroux / Macmillan. The review copy comes from our personal library. If you make a purchase using the Amazon links on this site, a small portion goes to Great Kid Books. Thank you for your support.